2. Pat the chicken dry and place in a roasting dish. Slice small tears in the skin and slip butter under to keep the chicken moist. Rub it all over with olive oil, lemon zest, rock salt and pepper. 3. 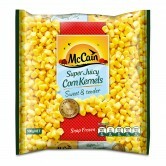 To make the stuffing, combine the McCain Corn Kernels with finely chopped parsley. Pour it into the chicken cavity and then shove in half a lemon to prevent the corn kernels from slipping out. 4. Roast for about 90mins, or until the skin is crispy and golden and the juices run clear. 5. Serve with McCain Mini Roast Potatoes and a summer salad. 2 Pat the chicken dry and place in a roasting dish. Slice small tears in the skin and slip butter under to keep the chicken moist. Rub it all over with olive oil, lemon zest, rock salt and pepper. 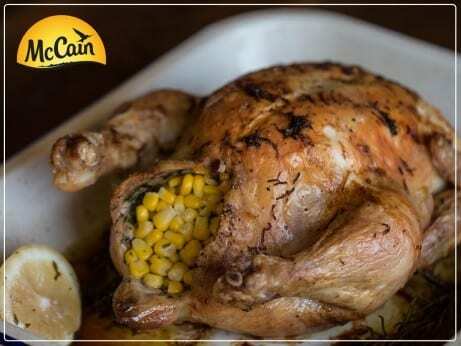 3 To make the stuffing, combine the McCain Corn Kernels with finely chopped parsley. Pour it into the chicken cavity and then shove in half a lemon to prevent the corn kernels from slipping out. 4 Roast for about 90mins, or until the skin is crispy and golden and the juices run clear. 5 Serve with McCain Mini Roast Potatoes and a summer salad.